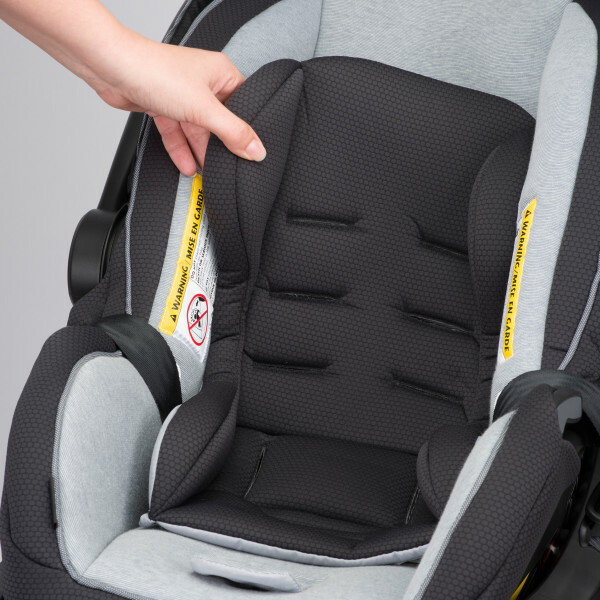 The ProSeries LiteMax™ Infant Car Seat by Evenflo® is a must-have for parents welcoming a new baby to their family. You’ll be able to take to the road with confidence and peace-of-mind knowing that your baby is protected from every angle – including side-impact and rollover. 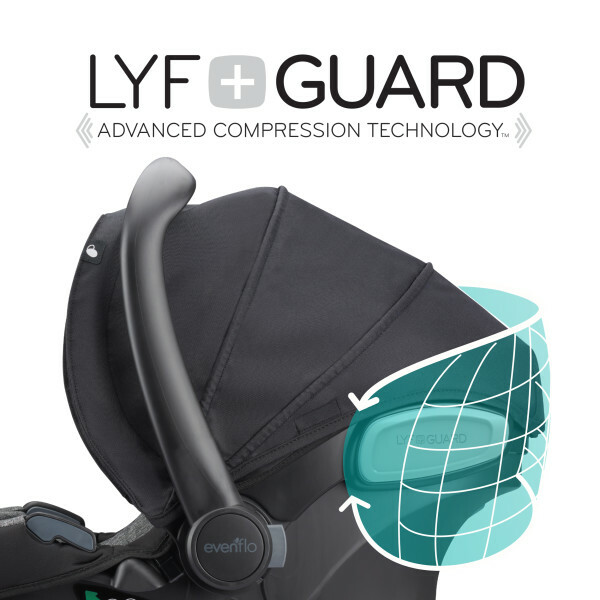 ProSeries Litemax features Lyf+Guard®, Quick Connector® Technology and Buckle Pockets. 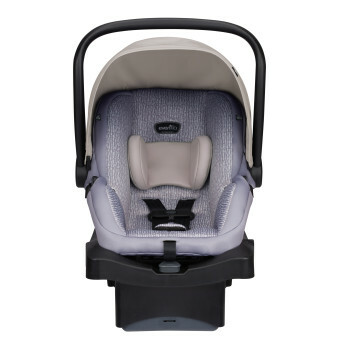 To see the discount, add a select infant car seat and an extra base to your cart. Lighter than the leading competition, the LiteMax infant car seat is finely-tuned with features designed to minimize overall parent-effort. 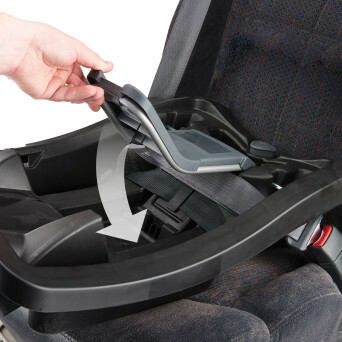 The LiteMax includes a stay-in-car convenience base with an integrated belt lock-off system that helps assure you that the seat is installed correctly while providing a quick and secure connection. The upfront harness adjustment, cozy infant head support, and a mom-friendly handle provide an easy transfer from home to car. The LiteMax's expanded child weight-rating make it suitable and nationally-recognized by safety advocates for use with lower birth-weight babies. Compatible Travel Systems: Sibby - sibling ride-along travel system, INVIGOR8 - jogging system. 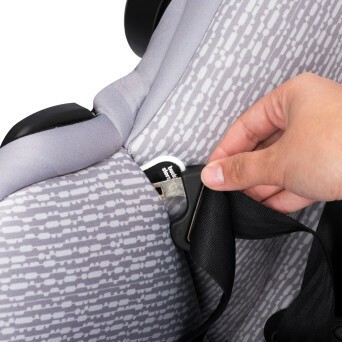 Fit: The top of the child's head must be at least 1 inch below the top of the child restraint seat back. ProSeries LiteMax Infant Car Seat (Eugene Tweed) is rated 4.5 out of 5 by 75. Rated 5 out of 5 by Dixielynn0630 from Best Infant Carrier! I already purchased an evenflo convertible car seat and after seeing the Litemax in person I HAD to buy it for my son! The material is SO soft (unlike other infant carriers I looked at) and it was very affordable! I love how easy it is to adjust as my son grows, it was so easy to install, and it's very easy to carry! I would suggest only this carrier to anyone looking for one! Rated 5 out of 5 by M1978 from Absolutely Love It! This car seat is great! Our little guy fits perfectly in it, he's tiny, only weighing 9 pounds at 3 months of age. The amount of recline keeps him comfortable and not "stuffed" in the seat! It's lightweight and easy to carry. I couldn't be happier with this product! 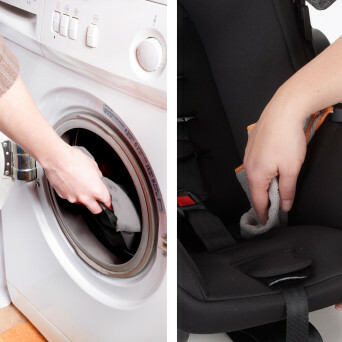 Rated 5 out of 5 by Blaise from Great Babyseat for my newborn Subject: Even flo Sensor Safe baby seat for my newborn. I Just got my hands on just this beauty for my second child and I wish I had it for the first....way easier to get my kid in and out of seat, and it's lighter so it's much easier to carry up and down stairs. 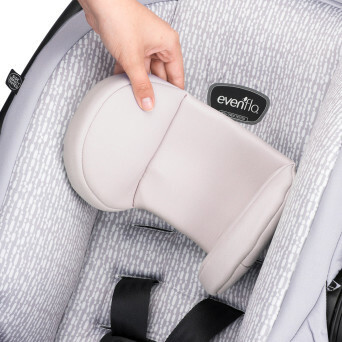 I bought it at babies r us and it was very competitively priced in relation to competitor products, but what had me sold was the Evenflo sensor safe technology. I like the peace of mind knowing my son is secured safely in his seat by way of the sureLATCH and sureSafe systems that use audible notifications to signal if a belt has unbuckled, or as a reminder to remove my son from his seat when departing my truck. I would highly recommend this products to other parents. Rated 4 out of 5 by MommaAbs from Lightweight dream Lightweight does not begin to describe the ease in picking this seat up. The seat has the name “LiteMax” and let me tell you, it is absolutely lightweight. It has a nice comfy cushion that has a memory foam feel to it. The buckle system is easy and adjust well to the baby as it grows. The canopy is sturdy and actually provides decent shade to the infant compared to many other seats (it has a panel zipped in the canopy for extra shade). I wasn’t impressed with the handle bar for carrying- I don’t think it moves with ease and feels kind of cheap, but it’s not a reason to not use the seat. The base is not bulky and has a leveler to help with install. Evenflo’s latch system to attach a base or seat to the car is one of the best on the market and why I continue to come back to Evenflo every time. The compact size of the seat as well as the lightweight feature are reason enough for me to use this seat! 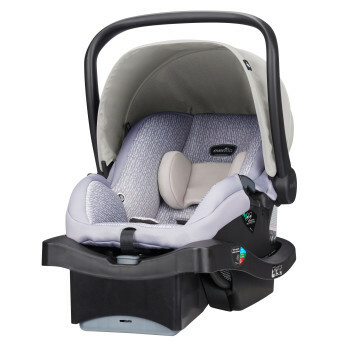 Rated 5 out of 5 by Leanrz84 from awesome infant carseat! This was one of the easiest car seat bases to install that my husband and I have done.It can be installed either by latch or seat belt. We used the latch option. The built in recline indicators is nice for a safer install. This car seat sits in the back of our Hyundai Elantra with plenty of room for front passenger. Our other brand car seat makes it almost impossible for a front passenger as you have no leg room. So this was a refreshing change so my husband and I can both be in the sedan together with the kids instead of only one adult. Another nice feature is the handle can fold all the way behind the seat which allows for increased room for front passengers legs. Our car seat is in Raven Jet color which is a nice gender neutral dark grey color. The fabric is very soft to touch and does not get very hot when in the hot sun/car. It is filled with comfortable foam.The sunshade moves up and down quietly unlike my other brand which makes loud clicks. This is nice because it does not wake the baby when i want to provide her with shade. The head cushions are a nice feature. They provide plenty of support so when my baby sleeps her head does not end up at a weird angle. The crotch pads and harness strap pads are another great comfort feature of this car seat. This is a nice lightweight car seat. For safety I really enjoy the sensor in the chest clip. It connects to your on board computer system and beeps when the chest clip is fastened. This is a nice reminder that "Hey you have a child in the car!". We have another Evenflo car seat in the same car as well and the 1 sensor works with both car seats. Overall I give this car seat 5 stars and would highly recommend to any parent or grandparent looking for a car seat for their newborn. 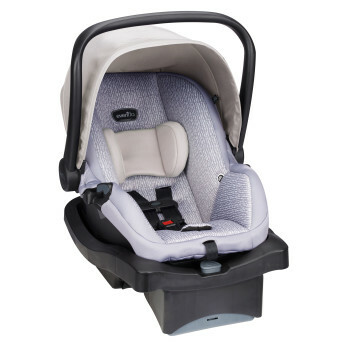 Rated 5 out of 5 by Jojo22 from Great car seat! I received this car seat about two weeks ago and am super happy with the product. I really enjoy how thickness of the padding. The bright green chest buckle is easy to see especially st night. The buckle storage is awesome, something inhabitant seen before. 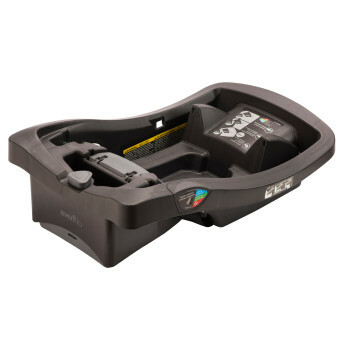 The car seat is overall light weight and I really like that the carrier handle fold all the way behind the seat so it won’t flip backward when on the ground! The seat is easy to remove from the base and easy to install too. The sun visor is really dark which keeps the sun out great. I drive a CRV and have two toddle car seat in my vehicle. All three car seats fit since this car seat is narrow which is a huge plus for me! Great seat with some really inventive additions! Rated 2 out of 5 by Phlox from I'm just not sure The car seat has positive and negative qualities. The most disappointing is our baby can undo the chest strap with ease. The buckle holders don't hold the buckles. I wish it came with more than one size in head pillow because our baby out grew it fast. When carrying the seat, it hits your legs with the handle and bruises them... It's awkward to carry. Sometimes the release from the base gets stuck and it's hard to remove. The straps are constantly flipping themselves around because of the angle of the buckles. Difficult to tighten straps. I wish the canopy would rotate forward to block the sun from getting in baby's eyes when driving. The base is amazing and easy to move from one vehicle to another. No problems yet with it.